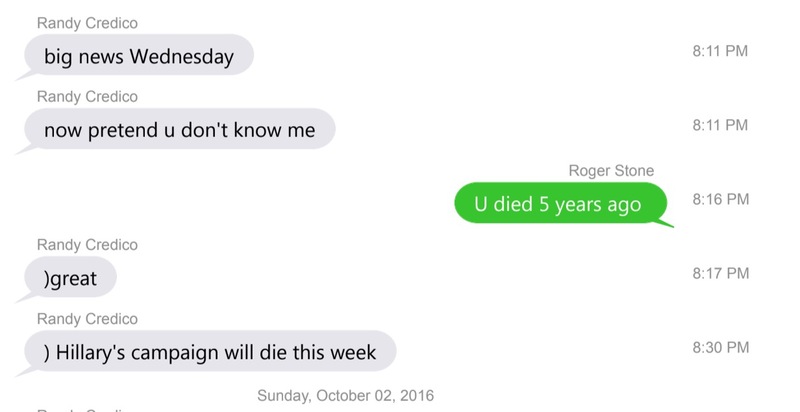 New text messages show that Roger Stone learned about WikiLeaks’ plans to release Clinton-related emails through Randy Credico. The messages, which Stone’s lawyers extracted from an old phone on Wednesday, back up Stone’s claims about how he learned of WikiLeaks’ plans. 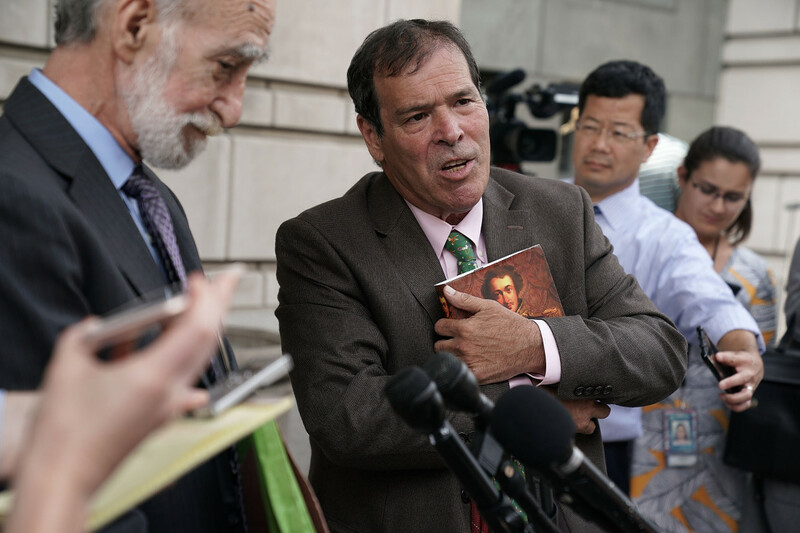 The messages severely undercut Credico’s denials that he was a source for Stone. Robert Mueller has been investigating whether Stone had advance knowledge of WikiLeaks’ plans to release emails stolen from John Podesta. “You are not going to drag my name into this are you,” Credico wrote on Sept. 29, 2016, suggesting that he was worried that Stone would identify him as his source for public claims he was making about WikiLeaks’ plans. Stone’s knowledge of WikiLeaks’ plans has been a central focus of special counsel Robert Mueller’s Russia investigation. Prosecutors have questioned numerous Stone associates to find out how the longtime political operative appeared to have advance knowledge that WikiLeaks would release information damaging to the Clinton campaign. Stone, 66, reluctantly told the House Intelligence Committee in October 2017 that Credico was his back channel to WikiLeaks and Assange. But he has claimed that he did not know the source or content of the Clinton campaign emails. Credico has adamantly denied being Stone’s conduit, saying in numerous interviews over the past year that Stone was lying. Credico also told CNN that his testimony to Mueller’s grand jury on Sept. 7 was consistent with his public denials about being Stone’s source. Pointing to the text messages, Stone asserts that Credico “lied to the grand jury” if he indeed denied being Stone’s contact to Assange. 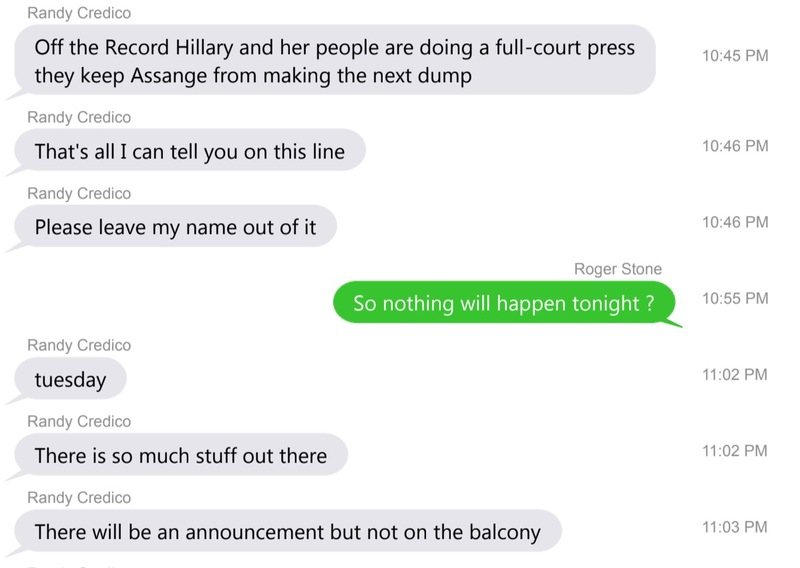 “These messages prove that Credico was the source who told me about the significance of the material that Assange announced he had on Hillary. It proves that Randy’s source was a woman lawyer,” Stone told TheDCNF. Stone, who is the men’s fashion editor for The Daily Caller, had struggled for months to provide evidence to back up his claims about Credico. The former friends had engaged in a he said-he said battle through various media outlets for months. It is unclear whether Mueller’s team has also obtained the messages. Credico provided Stone an update on Assange’s plans days later. WikiLeaks began releasing Podesta’s emails on Oct. 7, 2016. Mueller’s grand jury has recently heard testimony from two other witnesses who said Credico acknowledged being a source for Stone. David Lugo, a filmmaker who has worked with Credico and Stone, testified on Oct. 19 that Credico told him on May 12, 2017 that he was Stone’s point of contact. Lugo told TheDCNF that he also testified that Credico threatened earlier this year, well before his testimony, to “put a bullet in my head” for speaking out in defense of Stone. Tyler Nixon, a lawyer who has worked for Stone, testified on Nov. 2 that he was at a dinner party in mid-November 2017 when Credico acknowledged he was Stone’s source. Days after the dinner party, on Nov. 30, 2017, the news broke that Stone had identified Credico to the House Intelligence Committee.